Meet Miss Shepherd, an elderly homeless woman who lived in a knackered camper van in playwright Alan Bennett’s front garden in north London for 15 years. 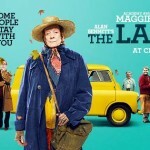 Maggie Smith played her in Bennett’s hit 1989 play and she takes on the role again in this hugely entertaining, big-hearted and funny film adaptation directed by the author’s long-standing collaborator Nicholas Hytner (The History Boys); it’s the movie equivalent of cosying with a warm buttery crumpet in front of a fire on a winter’s day! This heart-warming story of two eccentric individuals was filmed in the house on the street, Gloucester Crescent in London’s Camden Town, where the real events took place. Palace Theatre, London Road, Westcliff. Bar opens 6pm. Tickets available in advance from www.palacetheatresouthend.co.uk / 01702 351135 or on the door.